If you didn’t already buy all the Harry Potter movies for $10, you’re too late. Early Tuesday, Apple’s iTunes Movie Store began offering discounts on a slew of movie bundles. 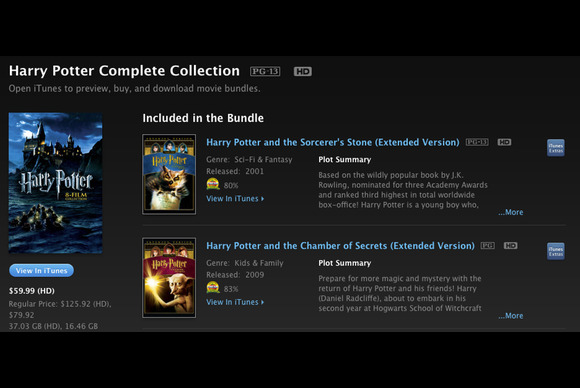 The best deal of all was the $10 price tag on Apple’s collection of the eight Harry Potter films—all in glorious high definition. The collection quickly shot to the top of the iTunes Movies sales charts. Though that 37.03GB of wizardly entertainment remains on sale, it appears that $10 price was too magical to last. Someone behind the scenes at iTunes has cast a price-raising spell; the collection now costs $60—still a substantial discount off the regular $125.92 price, but not the pulse-quickening deal that the $10 price was. Apple didn’t immediately respond to Macworld’s request for comment on the short-lived extreme sale. Some customers still report seeing the $10 price tag in the iTunes Store, though attempting to buy the collection at that price results only in an error. Other low-cost movie collections, including a $20 Godfather bundle, a $50 Star Trek bundle, and plenty more, remain available. You’ll see many deals in the U.S. store, a few in Canada, and may not have much luck anywhere else.